One of the things I missed most when I started keep kosher was JELLO. Ooey, gooey, jiggly jello. Mmm, mmm, good. And totally, totally not kosher. A few years later, I discovered a REAL and delicious brand of kosher gelatin, which we used to buy often enough in Toronto to keep me happy. However, here in Israel, there’s no such thing, just the insipid brands of kosher jello, which are based on vegetable gel and don’t – in my limited experience – set up properly to a shiny crystal-clear texture. So I’ve started playing with real gelatin since we’ve been here, because it’s cheap and plentifully available – and, as I think I’ve commented before, mysteriously pareve. There are two kinds; the red package is meat-source and the blue is fish-source. From bad experience in Toronto, I’ve found that fish gelatin gives a weird tangy taste to everything you use it in. This would probably be fine in a citrus-themed dessert (as shown on the box), but definitely not fine in a chocolaty dessert, or, perhaps, a strawberry one. 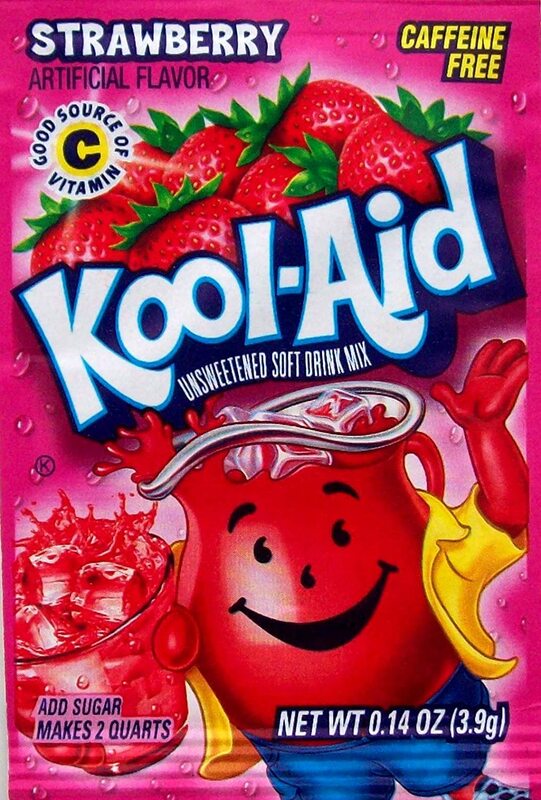 Okay, sure, you can’t buy Kool-Aid locally here in Israel, at least, that I know of. In Canada either, for that matter; I searched in vain when I was there in March, but they’ve gone over to those “water-flavour” drops which are pre-sweetened artificially. Ugh. Speaking of “artificially” – you can use this method to make delicious all-natural jello as well. I have made jello before using ONLY strawberries, when they’re in season (you can’t get fresh strawberries out of season here). I boil them in a heavy-bottom dutch oven with a little sugar until they are completely soft and surrounded by delicious, bright-red strawberry liquid. Yum! But this time, I really, really wanted the artificial strawberry taste I know and love so much. Pareve and decadent peanut-butter cookie dough truffles–EASY! It may not be summer yet, but we’ve had a few days so far that have really hinted that it’s on its way. And for summer Shabboses, what’s really nice is an easy no-bake dessert that isn’t tremendously patchkedik (involved, preparation-wise). These truffles capture the “cookie dough” vibe perfectly – they’re soft inside and not too sweet for a grown-up palate, but not too peanut-buttery and healthy-tasting (okay, they’re not healthy at all!) that kids will turn up their noses. In other words, they’re just right. And you can make them with just FIVE things you probably have sitting around your kitchen the week after Pesach – at least, I did.